A brilliant and skillful merging of classical and rock traditions is here used to present a story of the life of Johann Sebastian Bach. The full title of this album is "CONTAMINAZIONE di alcune idee di certi preludi e fughe de 'Il Clavicembalo ben temprato' di J. S. Bach." 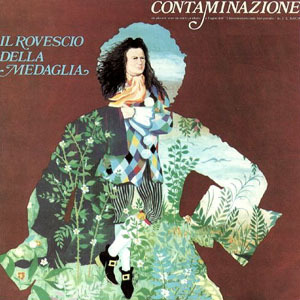 Hearing the album makes it obvious how much Il Rovescio della Medaglia was inspired by J.S. Bach life and music. Though Il Rovescio della Medaglia employed the same Argentinian composer/conductor that NEW TROLLS had used for their 1971 Concerto Grosso, Luis Enriquez Bacalov, I have to agree with many of my predecessors that the arrangements, integration, and recorded sounds of the orchestral inputs here are far, far superior to those on Concerto Grosso. These fit within and do not feel cheezy, diluted or soundtrack-like as do the ones in New Trolls' Concerto Grosso. A rare and gleaming achievement of integration of rock and classical music as well as a great story foundation. In my opinion, this is one of the peak achievements of the classic RPI scene.